Teams must now fly to Saskatoon, Saskatchewan with only a toonie added to their BMO CashBack World Elite MasterCard. Once at the airport in Saskatoon, teams must head out onto the tarmac where they must find a combination of Air Canada routes flying to at least 3 continents with a flight duration totaling exactly 25 hours. Since this is the last Leg they are allowed to use it, Brent & Sean decide to use their Express Pass. The pilot hands them the next clue revealing the Road Block. 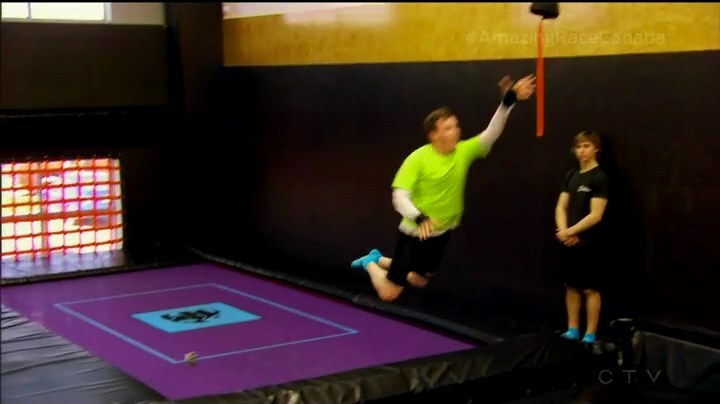 For this Road Block, teams hop into a Chevy Cruze to drive themselves to Apex Trampoline Park. Here, they must complete a three-part trampoline course. Dujean & Leilani decide to take a penalty and leave in 2nd. After two unsuccessful attempts, Neil (without talking to Kristin first) decides to take a penalty as well. Over at the trampolines, Brent finishes the Road Block and they open the next clue envelope which contains a bottle cap pointing them to Great Western Brewing Company. Dujean, meanwhile, has no problem on the course. Back on the tarmac, Gino & Jesse have computed a bunch of route durations and decide to work with Brian & Cynthia and Nick & Matt to share calculations to make the work easier. The strategy works, leaving Simi & Ope in last. They are determined to finish this on their own. The three teams catch up to a struggling Neil at the Road Block. Across town, Brent & Sean arrive at the brewery where they must search a bin of 5000 caps for 15 which are identical to the original pale ale cap they received in their clue. They maintain their lead going into the Detour. 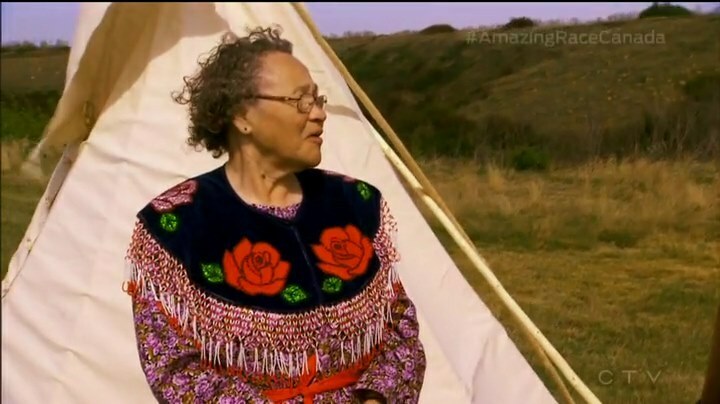 For this Detour, teams will drive to Wanuskewin Heritage Park. In Mikwap, teams will build a teepee. In Nimitook, teams must perform a hoop dance and correctly create five spiritually symbolic shapes. Brent & Sean choose Nimitook. 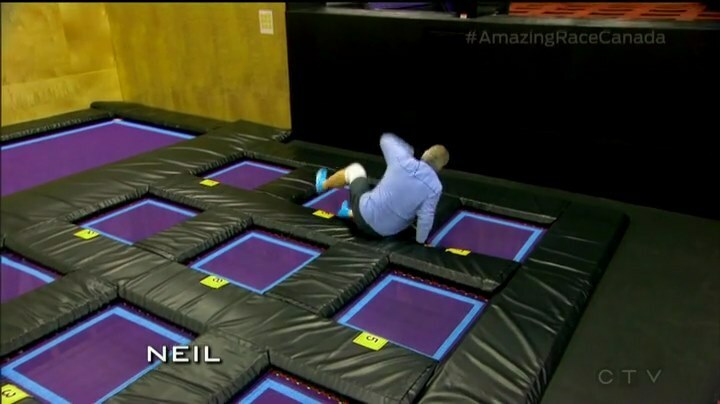 At the trampoline, Neil finally finishes and leaves Brian who has also been struggling. As Gino & Jesse pass Nick & Matt at the bottle caps, Ope finish the Road Block. Brian & Cynthia are lost and frustrated. 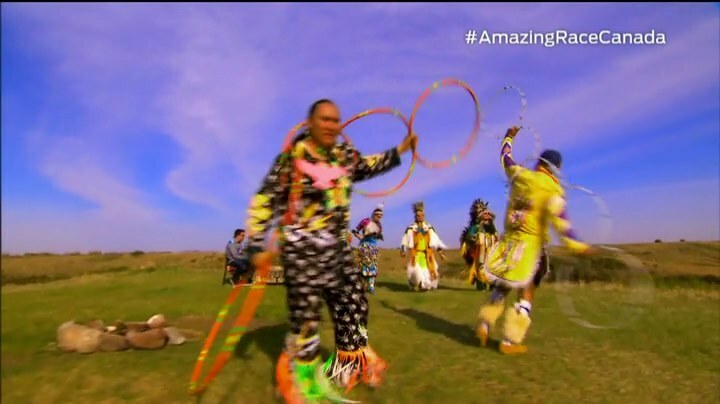 Gino & Jesse start building a teepee while Brent & Sean and Dujean & Leilani continue dancing. Finally on their 6th attempt, Brent & Sean get the thumbs up and can make their way on foot to Wanuskewin Lookout Point for the Pit Stop. 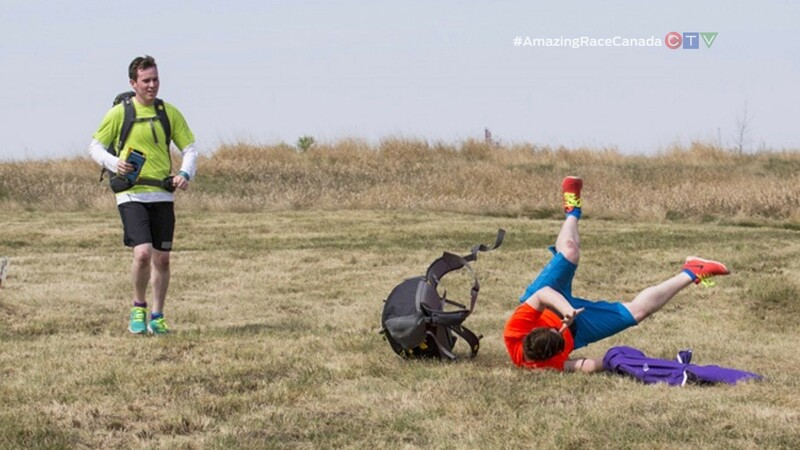 Gino & Jesse also finish the Detour, but it is Brent & Sean’s Leg to lose. 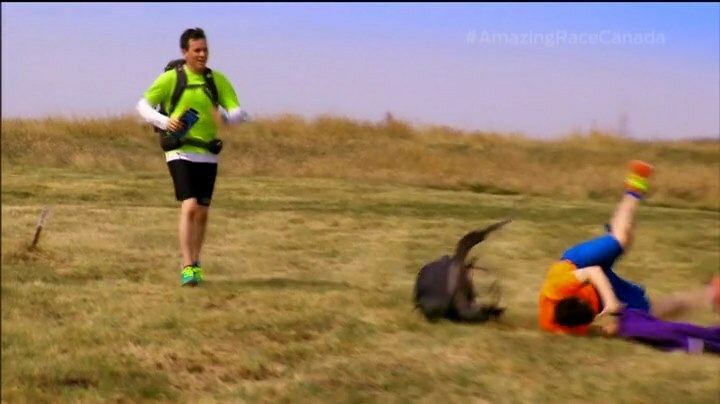 Sean rolls down the hill and throws up at the Mat before Jon officially checks them in as Team #1. Brent’s birthday is extra special as Air Canada will fly them to Paris while Petro Canada will give them 5 million Petro Points for a year of free gas. Gino & Jesse have to settle for 2nd. 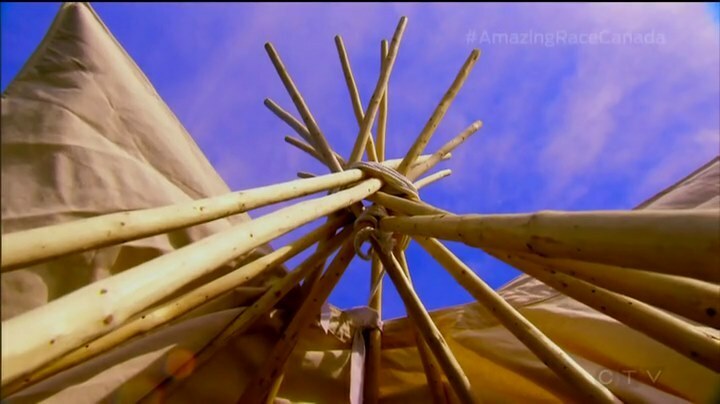 Nick & Matt ask for a check of their teepee, but Mary, the First Nations Elder, tells them their sticks are wrong. Four times. Dujean & Leilani take four attempts with the dancing and they run to the Pit Stop where they begin their 2-hour penalty. Brian & Cynthia, still frustrated, choose Mikwap as do a just arrived Neil & Kristin. Not getting anywhere, Neil & Kristin decide to throw a Hail Mary and switch to Nimitook. After a 6th fail with the teepee, Nick & Matt also switch. On their 6th attempt with the dancing, Neil & Kristin get the thumbs up and head to the Mat where they begin their own 2-hour penalty. Jon calls Dujean & Leilani over as their penalty is up to officially check them in as Team #3. Brian & Cynthia finally get their teepee right and head to the Pit Stop where they are Team #4. Nick & Matt are on their 8th attempt and pass when Simi & Ope arrive. Nick & Matt finish in 5th. Simi & Ope are on their 4th attempt and after enjoying the culture and the people, they get approved. They hurry to the Pit Stop. That means Neil & Kristin are last and eliminated. This episode started off a little slow, but definitely picked up. Overall, it was pretty solid. It was sad to see two teams just quit it. The bottle caps were okay since it didn’t seem as hard as it could’ve been and was just a random extra task. The Road Block seemed very uncreative at first, but it did make for some good mini-drama. The Detour was great though and it was good to see teams actually struggling and then switching. Plus, Mary was awesome. One thing at the end though. Why did Jon check-in Simi & Ope as Team #7? That’s a pretty glaring mistake. Very strange. Simi & Ope are my top team this week. They stuck to their guns at the beginning and didn’t give up the rest of the Leg. They were definitely lucky Neil & Kristin took a penalty, but who knows how things could’ve turned out if no one took the penalty and Simi & Ope ended up finishing before them anyway? I’m just hoping at least one father-daughter team makes it to the final Leg. A big drama episode for Brian & Cynthia and it was hilarious fun! I’ve definitely noticed Brian’s favorite catchphrase, “I’m not impressed.” So random and hilarious. They’re definitely fun to watch both with their bickering and their consistent good Racing. I was definitely sad to see Neil & Kristin quitting the first task. Especially when Neil apparently did it without confirming with Kristin first. Quitting should not be a “strategy,” especially when four other teams actually did the task, no problem. Still, they were a great team to watch on the Race. Especially Kristin. Brent & Sean had a good win this Leg. But OMG at the Pit Stop. That must have been the most insane run to the Pit Stop ever! Sean rolling over himself and then gagging (vomiting?) right at the Mat. WOW! lolol. Hilarious. They definitely have a chance to go all the way since they’ve been very consistent and haven’t really had trouble with certain tasks. They’ve even overcome some of the harder tasks this season too like the synchronized swimming for example. 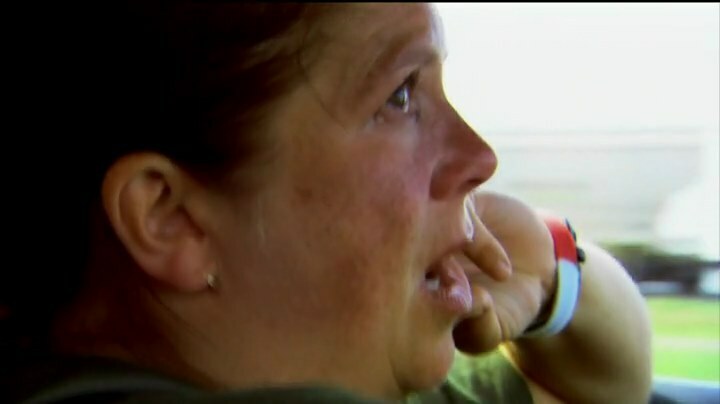 Also sad to see Dujean & Leilani so easily quit that first task. They’ve shown they can do anything and Race hard so it’s really disappointing that they’d just give up on that task instead of pushing through it like they’ve done any other task. 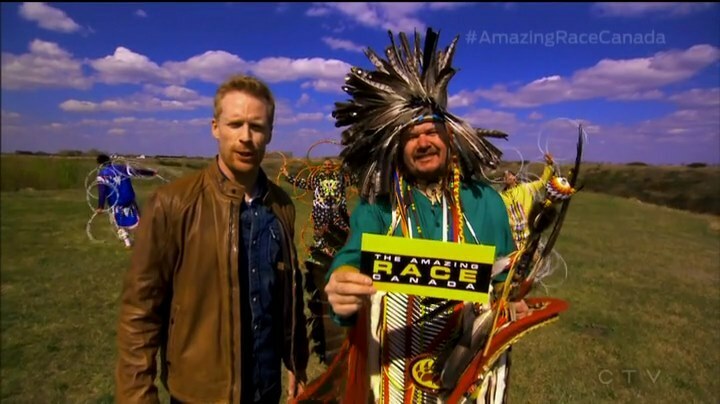 Gino & Jesse and Nick & Matt are fine and I would not be surprised to see one or both in the final Leg either. They’ve Raced well. If you really want consistency, there’s Nick & Matt. And Gino & Jesse have recovered very well from their horrible early Legs. ← Recap: Kamen Rider Drive, Episode 41 – How Was the Golden Drive Born?